Paddington is happily settled in with the Brown family in Windsor Gardens, where he has become a beloved member of the community, spreading joy and marmalade wherever he goes. While searching for the perfect present for his Aunt Lucy’s 100th birthday, Paddington spots a unique pop-up book in Mr. Gruber’s antique shop and embarks upon a series of odd jobs to buy it. Hilarity and adventure ensue when the book is stolen and Paddington and the Browns must unmask the thief. 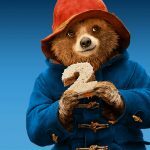 This sequel, like the original movie, is based on the popular series of children’s books by Michael Bond. This PG movie runs for 1 hour and 44 minutes. No registration is needed to attend this FREE event! It is sponsored by the Friends of the DeKalb Public Library. For additional information, please visit the Library Event page, or contact Theresa at theresaw@dkpl.org or at (815) 756-9568 ext. 3350.